An increasing number of nonprofit organizations are relying on satellite imagery to monitor environmental degradation. Chief among them is SkyTruth, which has used this data to expose the extent of the BP oil spill, uncover mining damage, and track illegal fishing worldwide. It was the summer of 2013, and the group, SkyTruth, had just launched a crowdsourcing project on its website to map fracking activity in Pennsylvania. The site provided volunteers with U.S. government aerial images from across the state and a brief tutorial on how to identify fracking locations. Within a month, more than 200 volunteers sorted through 9,000 images to pinpoint 2,724 fracking wellpads. Schwartz ended up using this data in a study published last October in the journal Epidemiology, showing that women living near hydraulic fracturing sites in 40 Pennsylvania counties faced a significantly elevated risk of giving birth prematurely. That’s precisely the sort of result that John Amos, SkyTruth’s president, envisioned when he founded the group in 2001. He has since become part data analyst, part environmental advocate, and part satellite-imagery proselytizer as he looks for ways to use remote sensing to call attention to little-noticed environmental damage. This month, SkyTruth’s website is displaying a map showing the global prevalence of flaring, the wasteful and carbon-spewing oil industry practice of burning natural gas and other drilling byproducts. Through most of December, SkyTruth and another satellite-focused nonprofit, Moscow-based Transparent World, displayed images of a burning oil platform and a 2,300-barrel oil slick in the Caspian Sea. The platform’s owner, Azerbaijan’s state-owned oil company, SOCAR, denied that any spill had occurred. “Big Brother is watching,” warned World Fishing & Aquaculture, a trade journal. That admonition could be extended to all the extractive industries — oil and gas, mining, logging, and fishing — whose operations can be tracked by remote sensing. A growing number of governments now conduct environmental observation by satellite, including Brazil, which monitors deforestation in the Amazon. And environmental groups now commonly use remote sensing tools. One prominent example is Global Forest Watch, a system launched two years by Washington-based World Resources Institute to monitor logging and fires in the world’s forests. Russia-based Transparent World employs satellite imagery for many purposes, including monitoring of protected areas and observing the impacts of dam construction. Amos, 52, says he considered himself an environmentalist even while he spent a decade working for oil and gas companies as a satellite imagery analyst looking for drilling sites. He quit in 2000 to start a non-profit that would apply his skills to environmental protection. For years he ran SkyTruth from the basement of his Shepherdstown, West Virginia home on an annual budget of less than $100,000, and he still speaks of “begging” satellite images from commercial providers. Although SkyTruth has expanded in recent years to eight employees supported by a $600,000 budget, it is still tiny, particularly compared to the U.S. government’s massive satellite resources. Nevertheless, SkyTruth has delved into realms that the government has avoided. One reason, Amos says, is that satellite imagery analysis is so unfamiliar that “nobody has known what to ask for” — thus, one of SkyTruth’s missions is to show what’s possible. Its usual method is to release a trove of environment-related data, then invite researchers and crowdsource amateurs to analyze it. SkyTruth has benefited enormously from the explosion in the last 15 years in satellite imagery and other digital technologies. When Amos started SkyTruth, a single Landsat satellite image cost $4,400; now the entire U.S. government collection— more than 4.7 million images and growing daily— is available free of charge. Not only have satellites and satellite imagery become cheap, but the capacity to analyze, duplicate, send, and store satellite data has expanded by orders of magnitude. In fact, satellite technology is now considered a subset of a larger field, geospatial intelligence, which has tens of thousands of practitioners around the world employing an array of optical, thermal, radar, and radiometric remote sensing tools. From more than 1,000 available chemicals, fracking operators select a dozen or so that fit the geological challenges of a particular site. The quandary led Amos to venture beyond satellite imagery into the larger field of geospatial data. Along with several better-known environmental groups, SkyTruth argued for disclosure of the recipe used at each frackingsite. Two industry lobbying groups, the American Petroleum Institute and America’s Natural Gas Alliance, defused mounting Congressional pressure for mandatory disclosure by launching a website, FracFocus, where operators could post their recipes voluntarily. But soon after the site’s launch in 2011, users found that information posted on it was entered in the wrong field, misspelled chemical trade names, or omitted key facts deemed proprietary. The site thwarted researchers by requiring postings in a format that computers couldn’t read. SkyTruth’s lead programmer, Paul Woods, devised a way around some of FracFocus’ barriers by writing software that “scraped” all the chemical data from the tens of thousands of reports posted on the site. Then he posted it in a database on SkyTruth’s website. In addition, under pressure from SkyTruth, other environmental groups, and an Energy Department advisory board, FracFocus agreed to make its data available in machine-readable form beginning in May 2015. These developments have yielded more and more information for researchers, such as Schwartz, who are investigating fracking’s health impact. “This is a very wonky issue that makes people’s eyes glaze over,” Amos said. The first time that SkyTruth attracted national attention was in April 2010, when Amos received a Google alert that an oil platform called Deepwater Horizon, 50 miles off the Louisiana coast, had exploded and burned. Amos knew explosions like this one were uncommon and usually led to spills. 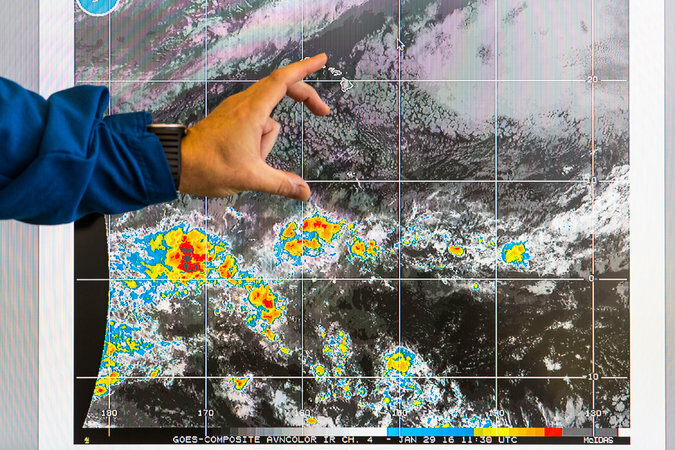 He began searching for satellite photos, but the first ones he found were obscured by clouds. Meanwhile, BP, which leased the rig, and the Coast Guard, echoing BP, maintained that the ruptured well beneath the rig was leaking oil at a rate of 1,000 barrels a day— a major spill but perhaps not a catastrophic one. The number was vital, for it would help determine the scale and strategy of the leak containment effort, the eventual cost to BP in fines and damages, and the scope of preparations for the next spill. It took Amos six days to acquire clear images. He calculated that the slick was 50 miles long and covered 817 square miles. He outlined the slick, along with his calculations, and posted both on SkyTruth’s website. Within a day, Ian MacDonald, a Florida State University oceanographer and oil slick authority, notified Amos that the leak’s flow rate was much bigger than a thousand barrels a day. Using Amos’ calculations of the lick’s size and conservative assumptions about its thickness, MacDonald concluded that it was “not unreasonable” that the leak was 20 times BP’s initial estimate. Undermined by SkyTruth’s numbers, the National Oceanic and Atmospheric Administration conceded the next day that BP’s initial estimate was too low: over BP’s public objections, NOAA revised the government estimate to 5,000 barrels a day. Two months later, — prodded, in part, by SkyTruth — government scientists concluded that the initial flow rate was 62,000 barrels a day, 62 times BP’s initial estimate. SkyTruth has also affected the course of mountaintop removal coal mining. Appalachian states have issued hundreds of permits for mountaintop removal mines, but they’ve rarely checked to see whether the mines have stayed within the permitted boundaries. Permits are supposed to be issued only after assessing impacts on downstream waterways, and a study of ten West Virginia counties published in 2004 by the state’s environmental protection department found that nearly 40 percent of mines in ten counties were situated outside permitted locations. The information was used in six peer-reviewed academic articles, including a Duke University study that found that once five percent of a watershed is mined, water quality in its rivers and streams usually fails to meet state standards. That study in turn provided empirical backing for the U.S. Environmental Protection Agency’s 2011 revocation of a mine permit in West Virginia that had been issued by the U.S. Army Corps of Engineers. The decision marked the first time the EPA had ever reversed a coal mine’s permit under the Clean Water Act. 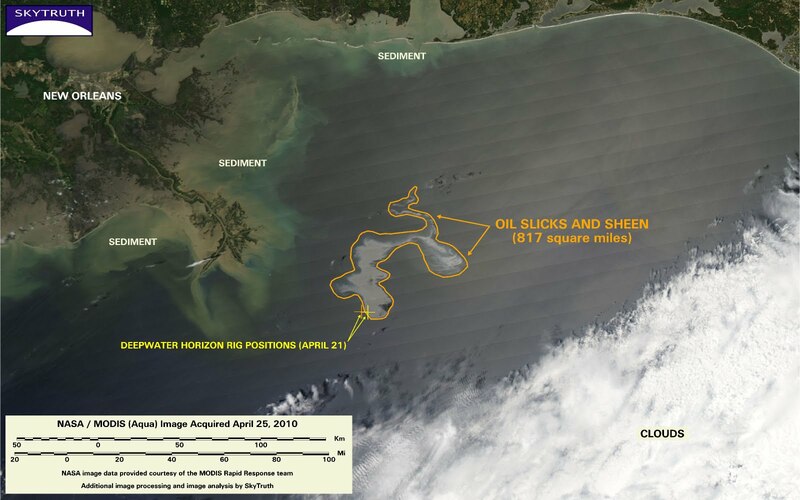 This June 21 2014 satellite photo from NASA, annotated by SkyTruth, shows an oil slick extending in an arc at least 8.3 miles (13.4 km) long from a well site at a Taylor Energy Co. platform that was toppled in an underwater mudslide triggered by Hurricane Ivan's waves in September 2004. In search of images that tell environmental stories, SkyTruth pays close attention to news reports, but occasionally it finds stories of its own. One example is what is probably the Gulf of Mexico’s longest-running commercial oil spill, at the site of a rig destroyed by an underwater mudslide during Hurricane Ivan in 2004. The slide buried 28 wells on the sea floor under 100 feet of mud, which made sealing them extremely difficult. The rig’s owner, Taylor Energy Company, went bankrupt trying. Amos discovered the leaks in 2010 while studying Hurricane Katrina’s impacts, and has been sounding an alarm ever since. The leaks have trickled steadily into the Gulf’s waters since 2004 at a rate Amos estimates at between one and 20 barrels a day, creating a slick that is sometimes 20 miles long. The wells are ten miles offshore in federally managed water, but no federal agency has tried to seal the leak. A notable exception occurred in 2009 when Amos testified at a U.S. Senate subcommittee hearing on the under-appreciated risks of deepwater oil drilling. Senator Mary Landrieu, a Louisiana Democrat, attacked Amos for overlooking the oil industry’s safety record and economic benefits. “You do a great disservice by not telling the American people the truth about drilling and putting it in the perspective it deserves,” Landrieu told Amos. Landrieu didn’t give Amos a chance to respond, but, as it turned out, he didn’t have to. The BP spill occurred five months later. Coast Survey’s navigation response teams have proven their value, time and again, especially after hurricanes when ports suspend operations, and shipping (or naval movements) cease until Coast Survey’s small boats can locate underwater dangers to navigation. But what do the six navigation response teams (NRTs) do during those long periods between deployments for maritime emergencies? They are busy, mostly year-round, collecting hydrographic data for updating nautical charts. Responding to requests from mariners around the country, Coast Survey has set some aggressive projects for the NRTs this year. Beginning in June and throughout the summer, NRT5 will survey the Hudson River, with a focus on the area from Albany to Kingston. This is a continuation of the project started at the request of the Hudson River Pilots (as reported in NOAA plans multiyear project to update Hudson River charts). We are planning to have Coast Survey research vessel Bay Hydro II join the NRT for most of the summer, to get as much new charting data as possible. In October, NRT5 will move to Eastern Long Island Sound, to finish up some shallow survey work adjacent to recent NOAA Ship Thomas Jefferson’s extensive survey project. 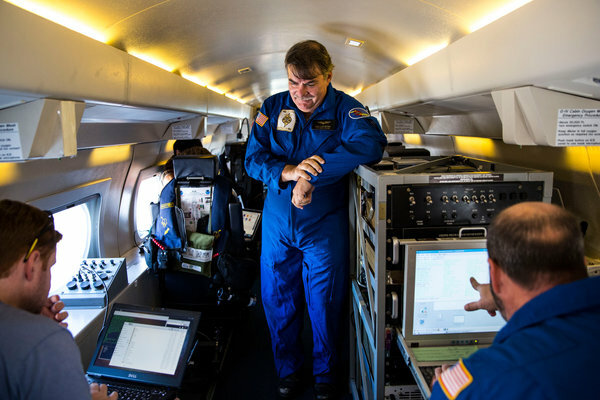 The officer-in-charge of NRT5 is NOAA Lt. Andrew Clos. The officer-in-charge of Bay Hydro II will be NOAA Ensign Sarah Chappel. In March, NRT2 starts a 16-month survey project in Saint Andrew Sound. The area, which has significant traffic from small boats, tugs, and barges, is reportedly experiencing small boat groundings, and Coast Survey’s navigation manager in the area has received several requests for a modern survey. Coast Survey will use the data to update NOAA chart 11504 and ENC US5GA12M, as well as other charts covering portions of the specific surveyed areas. The existing charted soundings are from partial bottom coverage surveys dating back to the early 1900s. NRT2 is led by Erik Anderson. NRT1 will check out the 18-yr-old reported depths to update chart 11376 inset. NRT1 will spend March and April acquiring data off the coast of Biloxi, Mississippi, to update the Intracoastal Waterway chart 11372. They will then move to Alabama for some long-overdue “chart clean up” work at the northern end of the Mobile Ship Channel, outside of the area controlled by the Army Corps of Engineers. The Mobile project will investigate charted items, verify reported depths, and update older NOAA bathymetry (vintage 1961) that is depicted in the inset area of NOAA chart 11376. Since the Mobile survey probably will not take the entire rest of the season, depending on interruptions for hurricane response, we are assessing additional survey needs in the area. NRT1 is led by Mark McMann. NRT4 will spend all of 2016 surveying in Galveston Bay, including the bay entrance and newly charted barge channels along the Houston Ship Channel. The team is working with Coast Survey’s navigation manager for Texas to identify additional charted features that require investigation to reduce localized chart clutter and improve chart adequacy. NRT4 is led by Dan Jacobs. NRT6 is slated to survey the Suisun Bay anchorage used by MARAD’s National Defense Reserve Fleet, to acquire updated depths. Afterwards, NRT6 will move throughout the bay area to address charting concerns reported by the San Francisco Bar Pilot Association near Pittsburg, Antioch, San Joaquin River, and Redwood City. Coast Survey will use the data to generally update NOAA chart 18652 and ENC US5CA43M, as well as larger scale charts of the specific surveyed areas. NRT6 is led by Laura Pagano. It has been a while since Coast Survey has had an operational NRT presence for Oregon and Washington, but this is the year we are bringing NRT3 back on line. Team lead Ian Colvert is shaking the dust off NRT3 and preparing to restart survey operations. He is working with the Coast Survey navigation manager to develop survey priorities for this summer and fall. Once the navigation response teams process and submit the data acquired during the surveys, the information is further processed in Coast Survey’s Atlantic and Pacific hydrographic branches, and then submitted to our cartographers for application to the charts. The turnaround time for updating the chart depends on the update calendars for each regional cartographic branch. If the NRTs find any dangers to navigation, the information will be relayed to mariners through the Local Notice to Mariners postings and will be applied to NOAA’s electronic navigational charts (NOAA ENC®), online products, and print-on-demand paper charts. Critical updates will be applied to charts more quickly than normal depth adjustments. Introducing Microsoft Project Natick, a Microsoft research project to manufacture and operate an underwater datacenter. The initial experimental prototype vessel, christened the Leona Philpot after a popular Xbox game character, was operated on the seafloor approximately one kilometer off the Pacific coast of the United States from August to November of 2015. Project Natick reflects Microsoft’s ongoing quest for cloud datacenter solutions that offer rapid provisioning, lower costs, high responsiveness, and are more environmentally sustainable. Today’s data centers, which power everything from streaming video to social networking and email, contain thousands of computer servers generating lots of heat. When there is too much heat, the servers crash. Putting the gear under cold ocean water could fix the problem. It may also answer the exponentially growing energy demands of the computing world because Microsoft is considering pairing the system either with a turbine or a tidal energy system to generate electricity. The effort, code-named Project Natick, might lead to strands of giant steel tubes linked by fiber optic cables placed on the seafloor. Another possibility would suspend containers shaped like jelly beans beneath the surface to capture the ocean current with turbines that generate electricity. 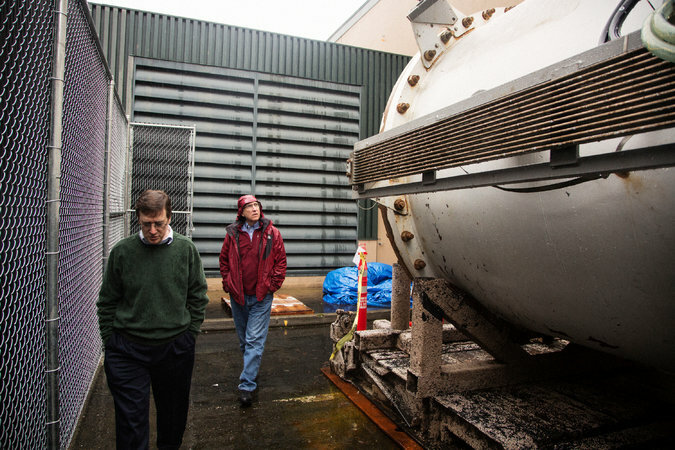 Ben Cutler, left, and Norman Whitaker, both of Microsoft Research, with the “Leona Philpot,” a prototype underwater data center, at the company’s headquarters in Redmond, Wash.
“When I first heard about this I thought, ‘Water ... electricity, why would you do that?’ ” said Ben Cutler, a Microsoft computer designer who is one of the engineers who worked on the Project Natick system. Such a radical idea could run into stumbling blocks, including environmental concerns and unforeseen technical issues. But the Microsoft researchers believe that by mass producing the capsules, they could shorten the deployment time of new data centers from the two years it now takes on land to just 90 days, offering a huge cost advantage. The underwater server containers could also help make web services work faster. Much of the world’s population now lives in urban centers close to oceans but far away from data centers usually built in out-of-the-way places with lots of room. The ability to place computing power near users lowers the delay, or latency, people experience, which is a big issue for web users. Driven by technologies as varied as digital entertainment and the rapid arrival of the so-called Internet of Things, the demand for centralized computing has been growing exponentially. The “Leona Philpot” prototype was deployed off the central coast of California on Aug. 10, 2015. “When you pull out your smartphone you think you’re using this miraculous little computer, but actually you’re using more than 100 computers out in this thing called the cloud,” said Peter Lee, corporate vice president for Microsoft Research and the NExT organization. The company recently completed a 105-day trial of a steel capsule — eight feet in diameter — that was placed 30 feet underwater in the Pacific Ocean off the Central California coast near San Luis Obispo. Controlled from offices here on the Microsoft campus, the trial proved more successful than expected. That led the engineers to extend the time of the experiment and to even run commercial data-processing projects from Microsoft’s Azure cloud computing service. The research group has started designing an underwater system that will be three times as large. It will be built in collaboration with a yet-to-be-chosen developer of an ocean-based alternative-energy system. The Microsoft engineers said they expected a new trial to begin next year, possibly near Florida or in Northern Europe, where there are extensive ocean energy projects underway. It is a large white steel tube, covered with heat exchangers, with its ends sealed by metal plates and large bolts. Inside is a single data center computing rack that was bathed in pressurized nitrogen to efficiently remove heat from computing chips while the system was tested on the ocean floor. For example, the new undersea capsules are designed to be left in place without maintenance for as long as five years. That means the servers inside it have to be hardy enough to last that long without needing repairs. They’re also rethinking the physical alignment of data centers. Right now, servers are put in racks so they can be maintained by humans. But when they do not need maintenance, many parts that are just there to aid human interaction can be removed, Mr. Whitaker said. 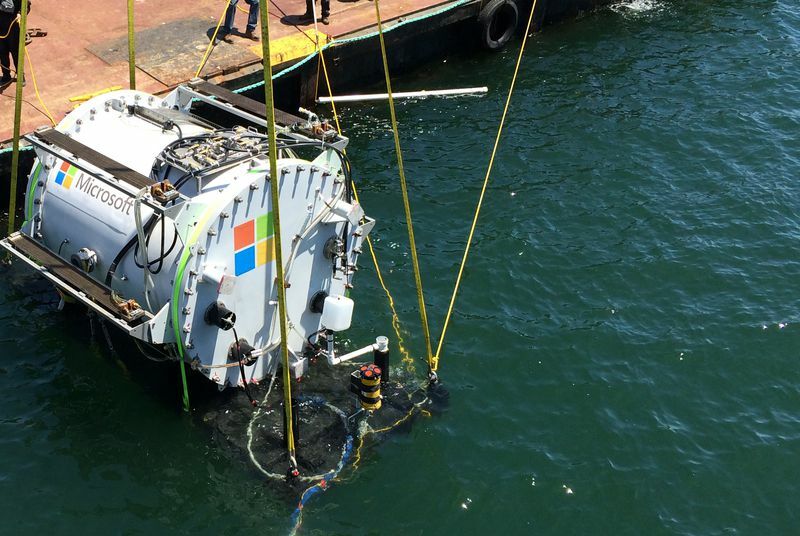 In the first experiment, the Microsoft researchers said they studied the impact their computing containers might have on fragile underwater environments. They used acoustic sensors to determine if the spinning drives and fans inside the steel container could be heard in the surrounding water. One aspect of the project that has the most obvious potential is the harvest of electricity from the movement of seawater. This could mean that no new energy is added to the ocean and, as a result, there is no overall heating, the researchers asserted. 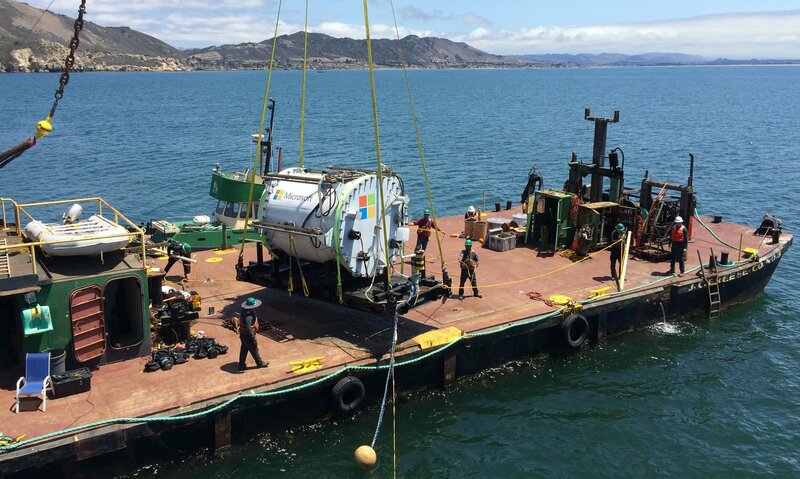 TheVerge : Microsoft is experimenting with underwater data centers. Is data better down where it's wetter? A rough estimate puts more than three million shipwrecks on the ocean floor. This number represents ships throughout the entirety of human history, from 10,000-year-old dugout canoes preserved in the muck to 21st century wrecks that you might have read about in the news. There are so many shipwrecks, in fact, that a search operation for the missing Malaysia Airlines Flight 370 has discovered two by accident. The Battle of the Atlantic alone, which spanned nearly six years during World War II, claimed over 3,500 merchant vessels, 175 warships, and 783 submarines. Particularly interesting are the cargo ships that literally contain treasure, such as Spanish galleons that transported gold and jewels across the Atlantic. The Uluburun shipwreck off the coast of southwestern Turkey is roughly 3,300 years old, and that Late Bronze Age vessel contained gold, silver, jewels, copper and tin ingots, tools, swords and other weapons, and much more trade cargo—all of it hauled up over the course of 10 years and 22,413 dives. But most wrecks don't receive that kind of attention. In fact, less than 10 percent of the shipwrecks that we we've located—which account for just 10 percent of all shipwrecks in the world—have been surveyed or visited by divers. Fishing trawlers snag on sunken ships, sonar readings pick them up, historical records tell us where they should be, harbor dredging operations uncover wrecks that have long been lost below the seafloor—but there simply isn't enough time and money to explore the vast majority of them. The Sweepstakes was built in 1867 as a two-masted schooner in Burlington, Ontario by John Simpson. The ship's length is 36.3m (119ft) and lays just below the surface in Big Tub harbor with a maximum depth of 7m (20ft). The Sweepstakes was damaged off Cove Island, then towed to Big Tub harbor where she sank in 1885. At times, the shipwreck will sit well below the surface of Lake Huron and then when the lake becomes shallower, sections of the Sweepstakes rise up out of the water making parts clearly visible. Throughout Fathom Five National Marine Park, there are 22 shipwrecks and many people come here to snorkel and scuba dive in these pristine waters. James Delgado, the Director of Maritime Heritage at the National Oceanic and Atmospheric Administration (NOAA), says that there are an estimated 4,300 shipwrecks within NOAA's 14 National Marine Sanctuaries. Of these, 432 have been dived on and surveyed. And these are shipwrecks within a mapped area set aside for preservation. "There are laws and regulations directing NOAA to find what lies in those waters and assess it," Delgado said in an email. Similar to other marine preservation organizations around the world, NOAA is not only devoted to discovering what the ships are, but also how their presence might affect the ecology of the marine environments they lie within. Outside of marine sanctuaries, there isn't as much of an incentive. 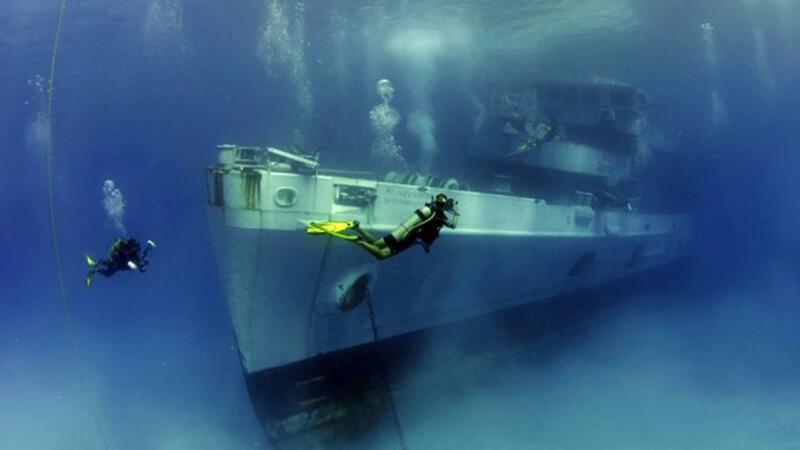 Most shipwrecks are documented for a much simpler reason: to avoid collisions or other incidents. 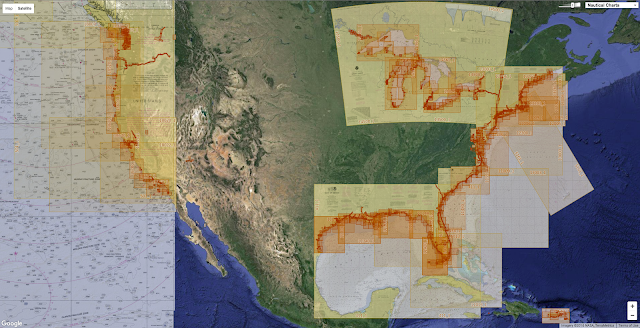 NOAA's Office of Coast Survey maintains a database of about 20,000 ships that is available to the public, primarily for the benefit of navigators and researchers. 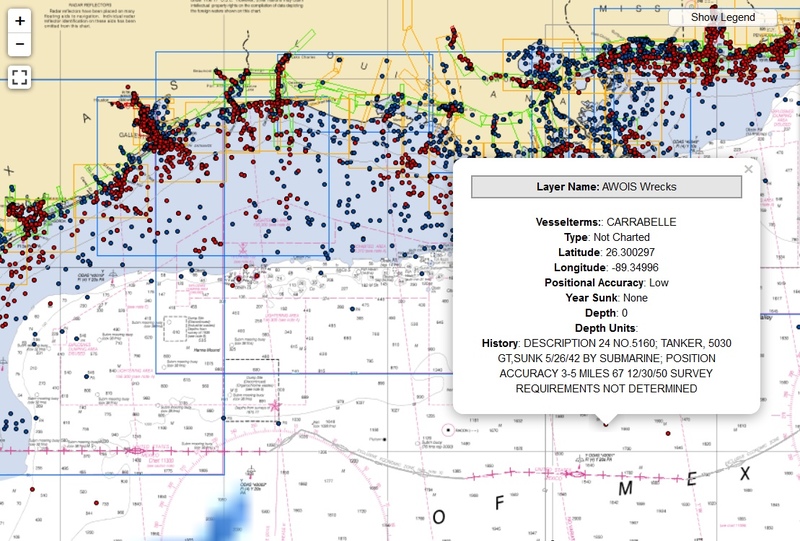 The information for that database comes from two organizations within NOAA, the Electronic Navigational Charts (ENC) and the Automated Wrecks and Obstructions Information System (AWOIS). Still, it's difficult to pinpoint exactly where a shipwreck is on the ocean floor. The database lists some limitations, including that it "contains wreck features from two different sources that were created for different purposes, and there is not a perfect match of features from either source. The same wreck may be found in both the ENC wrecks and AWOIS wrecks layers, although the positions may not necessarily agree." Still, there is an estimated $60 billion in sunken treasure around the world, just waiting at the bottom of the ocean. And that doesn't include the historical and cultural value of excavating shipwreck sites. So why don't we explore more of them? For one thing, it's hard to know what's worth the time. Diving operations can cost millions of dollars, and before we go down there, we have no idea what the ship is, what it was carrying, and what condition the cargo is in. In some cases, we are not even 100 percent sure that the identified object is a ship at all. "Not many people follow up on a target to determine if it is a wreck, and if so what type it is, and then if possible, which ship it is," says Delgado. It is possible, however, that the situation will improve. As Delgado points out, 90 to 95 percent of the sea floor itself remains unexplored. There are a number of efforts to change that, such as the Ocean Discovery XPrize that is offering $7 million in prize money for private teams that build an autonomous underwater vehicle (AUV) and create a bathymetric map (like a topographic map, but of the sea floor). The Schmidt Ocean Institute, founded by former Google CEO Eric Schmidt, maintains a 272-foot vessel outfitted with modern oceanographic equipment that scientists can apply to use for various research expeditions. The good news, for shipwrecks explorers at least, is that the majority of shipwrecks are actually near the coast, with a large percentage of incidents occurring in and around the entryways to ports and harbors. "Some harbors are tough to enter, like Oregon's Columbia River Bar, or leave, like San Francisco's Golden Gate and Bar, due to shifting winds, shifting sands, fog, storms, or strong tides," says Delgado. "But also for the same reason that most auto accidents seem to happen within a mile of home, and there are many accidents coming in and out of parking lots, people seem to be less cautious or more aggressive." With most shipwrecks so close to the shore, and multiple examples of wealthy patrons sponsoring exploration and research expeditions, we could see many of these unexplored shipwrecks investigated in the coming years. But even with advancing AUV technologies and efforts to map more of the ocean floor, many shipwrecks are likely to remain unexplored until they are buried below the sands or decay beyond the point of recognition.